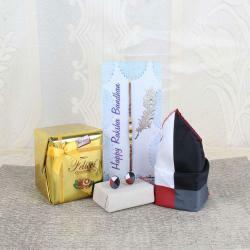 Product Consists: Bouquet of 10 Yellow Roses in a matching wrapping with ribbon bow tied, Gulab Jamun (Weight: 500 gms) along with Designer Rakhi. 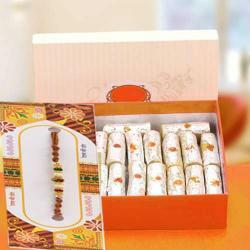 Raksha Bandhan can be made more special through this exclusive combo pack consisting of a Rakhi which is designed amazingly with Sweets. 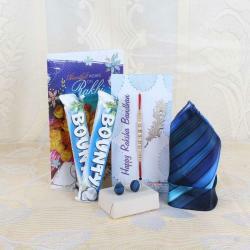 This combo promises to make Raksha Bandhan more special and heartwarming for your darling brother. 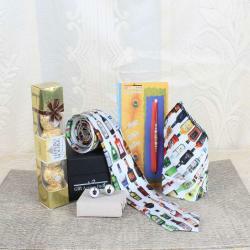 Giftacrossindia presenting exclusive and attractive rakhis to siblings as it has become an essential part of the Rakhi festival. Raksha Bandhan is an important Indian festival celebrating the epitome of the special bond shared between a brother and sister. This sweets will melt into your brothers mouth as it has a delicious fantasy which he never been before. A great combination of flavors and health, this hamper is a great reminder of love and care for your brother as it contains healthy items with special blessings and celebration cannot be completed without sweets. This pack will be perfectly symbolic of your love and warmth and will give your brother an unforgettable surprise to say the least. 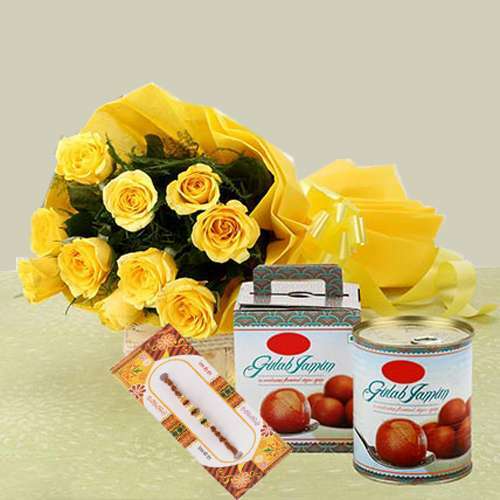 Product Includes: Bouquet of 10 Yellow Roses in a matching wrapping with ribbon bow tied, Gulab Jamun (Weight: 500 gms) along with Designer Rakhi.